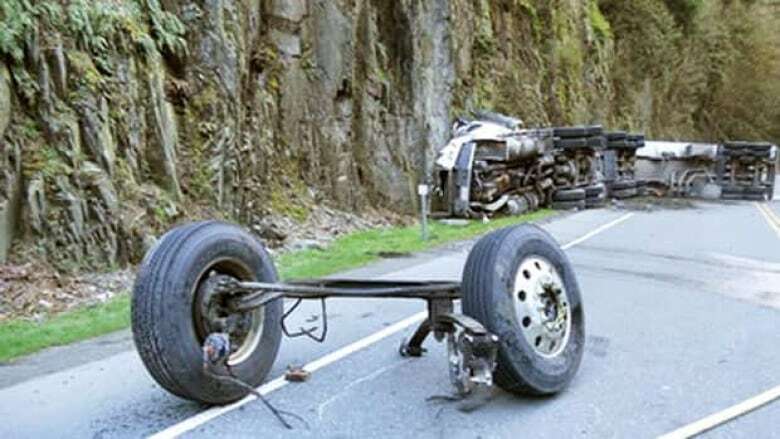 Officials on Vancouver Island are assessing the environmental damage after a fuel tanker rolled over on the Malahat Highway just north of Victoria on Saturday, dumping part of its load into Goldstream River. Officials on Vancouver Island are assessing the environmental damage after a fuel tanker rolled over on the Malahat Highway just north of Victoria on Saturday evening, dumping part of its load into Goldstream River. Witness Brian McIlwaine said after the crash, fuel was pouring out of holes in the tanker and into the nearby Goldstream River. "It was coming out of the pup trailer and it was going down the highway and into the Goldstream Estuary," he said. Officials say the fuel from the tanker likely spilled into the culvert on the side of the highway before travelling underneath the road and into the Goldstream river and estuary. The river runs through the old growth forest of Goldstream Provincial Park and is a spawning site for several salmon runs. Transport Canada flew planes over the area to assess fuel spreading on the water in Finlayson Arm, said B.C. Environment spokesman Alex Grant. "We have had some impact. We've seen some dead fingerlings up at the marina. Last night Environment Canada saw some. So we're going to have people out on the water," said Grant. "I think this could have been a lot worse. I'm feeling pretty optimistic at this point that it's going to be a good resolution.," he said. Langford's Fire Chief Bob Beckett said it was fortunate the fuel did not ignite. "Fortunately, it's been relatively cool, which keeps the flammable vapours down somewhat. A bit of a breeze to help move some of the vapours away," he said. Highway 1 was closed for 24 hours following the crash, but reopened on Sunday afternoon, following a massive clean-up effort. Police said the 33-year-old driver was not hurt in the crash, but is being investigated for impaired driving. Allan Williams of Columbia Fuels said the driver has been employed with the company since September and has been trained appropriately.